This time of year, we are feeling extraordinarily thankful. Even with the cooler weather making its way into New Mexico, Santa Fe has a way of making our hearts warm. The holidays are on their way, and this year at Adobe Destinations, we are making sure your holiday getaway is exactly what you pictured it to be. With the leaves finding their way to the ground and snowy weather seeking out Santa Fe in the upcoming months, we picture fireplaces lit, loved ones gathered around, and the Plaza tree lighting the Friday after Thanksgiving. The ski mountains will begin to open in the next weeks and cross country ski trails will be re-blazed. 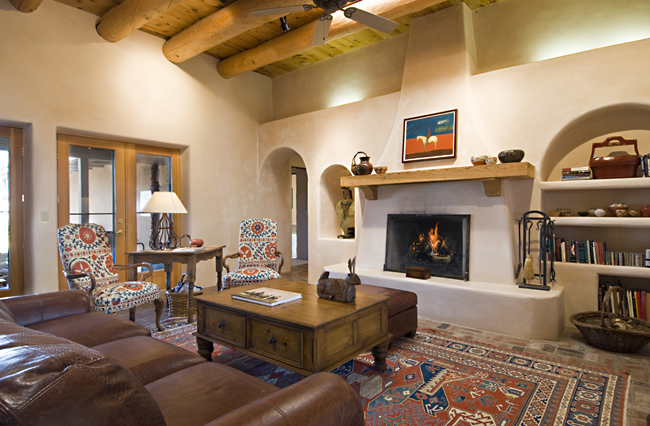 The four seasons of Santa Fe are distinct, yet the way Santa Fe shines this time of year is something not to miss. Find some Plaza Luxury at El Corazon. With this home’s downtown location, the events of Santa Fe can be fully experienced, all the while with a cozy house to return to at the end of the day. The warmth of the Mariposa home is beautiful and located just a block from the historic Canyon Road, it is the ideal downtown location. Multiple fireplaces and the secluded location of the Aria: Adobe at the Opera house, are the perfect place to spend a quiet, cozy winter. 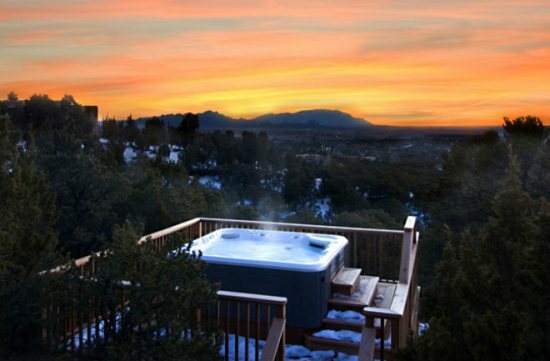 Our Jewel of Circle Drive home boasts a hot tub with a stunning sunset view, fireplaces and a wonderfully chic home. With the Thanksgiving holiday looming in the near future, we would like to extend a huge thank you to the wonderful family, friends, businesses and loyal clients in our life at Adobe Destinations. As we have the past ten Thanksgivings, we are looking forward to continuing our tradition of making pies for the Christian Brothers at St. Michael’s High School. We are excited to embrace this marvelous time of year. As always, we look forward to accommodating your visit, and we hope to see you in the upcoming months! This entry was posted in Holiday Rentals, Thanksgiving and tagged holidays, rent a home, rentals, Santa Fe, thanksgiving, winter. Bookmark the permalink.